Ischaemic stroke and neurodegenerative disorders are leading causes of death and disability. With the increase in life expectancy in Ireland and across the world, the incidence of stroke and neurodegenerative disorders is increasing rapidly. Current treatment regimes are limited in their effectiveness. The need is therefore increasing to understand the underlying key pathophysiological processes, and from this to develop new therapeutic strategies. Neuronal injury resulting from ischaemic stroke can be caused by multiple factors. The excessive release of excitatory amino acid neurotransmitters, in particular glutamate, during an acute ischaemic stroke can cause a significant overactivation of Ca2+ permeable NMDA glutamate receptors . In many experimental settings, a brief glutamate receptor overactivation is sufficient to trigger a NMDA receptor- and Ca2+-dependent neuronal cell death . Only a very limited number of neurons, such as motoneurons, express Ca2+ permeable AMPA glutamate receptors and are similarly susceptible. However, a prolonged activation of Ca2+ ‘impermeable’ AMPA and KA receptors can also trigger cell death due to the excessive influx of Na+ and water. Cell death induced by glutamate receptor overactivation has been termed ‘excitotoxic injury’ and also plays a key role in seizure- and trauma-induced brain injury [1, 3]. Recent studies have shown that other ion channels also activated during ischaemic or metabolic insults can trigger a Ca2+-dependent neuronal injury, including acid sensing ion channels (ASICs) and transient receptor potential channels [4, 5]. A role for plasma membrane Na+/Ca2+ exchanger inactivation has also been proposed . Importantly, excitotoxic injury and Ca2+ overloading have also been implicated in chronic neurodegeneration, in particular Alzheimer’s disease and amyotrophic lateral sclerosis (ALS) [1, 3, 7]. Clearly, in addition to and in co-operation with these major disturbances in ion homeostasis, other factors will influence cell fate during ischaemia or chronic neurodegeneration. Metabolic impairment with acute or prolonged mitochondrial dysfunction and/or ATP as well as NAD+ depletion may critically determine whether neurons survive or die [8-12]. Defects in protein folding, leading to endoplasmic reticulum (ER) stress, as well as defects in protein degradation are hallmarks of many neurodegenerative disorders [13, 14]. They also occur prior to the onset of ischemic neuronal injury , and are activated in selectively vulnerable neuronal populations such as CA1 hippocampal pyramidal cells . Oxidative stress, activation of astrocytes and pro-inflammatory processes, as well as endothelial barrier dysfunction and alterations in angiogenesis furthermore influence neuronal survival. Each of these stress stimuli (Ca2+ overloading, Na+ overloading, hypoxia, ATP depletion, acidosis, ER stress, proteasomal inhibition, oxidative stress, tissue inflammation) can activate a different set of cell signalling and gene expression cascades which typically only partially overlap. Moreover, most if not all of these stress signals can simultaneously activate defensive, cytoprotective pathways, as well as injury- or cell death-inducing pathways. Here, the activation of conserved cell death programmes such as apoptosis have been increasingly implicated [13, 16]. One of the major challenges in furthering our understanding of the pathophysiology of acute neuronal injury after stroke, ischemia/hypoxia or chronic insults to the nervous system is therefore (i) to understand the factors and decision points of stress-induced cytoprotection and cell death, (ii) to explore to which extent individual stress pathways contribute to neuronal injury, and (iii) how these stress pathways co-operate, oppose, or substitute each other. The qualitative and quantitative contributions of individual signalling pathways to a biological outcome can often not be satisfyingly estimated. We have therefore also begun to include more ‘holistic’ or ‘systems’ approaches to our research programme, which now encompass signal transduction, gene expression and protein interaction analysis, mitochondrial and cell physiology analysis, as well as mathematical modelling of biochemical and physiological systems. These techniques are applied in defined neuronal injury model systems with relevance to ischaemic stroke and neurodegeneration. Excitotoxic Injury: Our previous work has applied single-cell imaging of cellular and mitochondrial function along with biochemical and gene expression analyses to characterise key steps involved in the progression of excitotoxic injury in neurons [17-20]. We observed that a glutamate exposure or a selective overactivation of NMDA receptors can cause a continuum of different cell death forms [17, 18, 21, 22]. At one extreme, prolonged exposure to high concentrations of glutamate or NMDA causes acute, irreversible neuronal Ca2+ overloading associated with a rapid impairment of mitochondrial function, ATP depletion, and an early breakdown of plasma membrane integrity, characteristic of ‘necrotic’ cell death [21, 22]. At the other extreme, a brief, transient glutamate or NMDA stimulus results in a delayed form of injury characterised by a rapid recovery of cytoplasmic Ca2+ levels, retention of mitochondrial membrane potential (ΔΨm) and a temporary recovery of cellular bioenergetics. However, in vulnerable neurons, this ‘recovery’ is followed by a delayed Ψm depolarization, a delayed Ca2+ deregulation, and apoptotic cell death [17, 18, 21, 22]. Intermediate cell death forms are also frequently observed . We could also demonstrate the activation of the mitochondrial apoptosis pathway during excitotoxic injury, such as the release of apoptosis-activating factors from mitochondria [17, 18, 22, 23]. Excitotoxic ‘apoptosis’ displays nuclear condensation, phosphatidylserine exposure, and cell shrinkage. However, it frequently occurs without significant caspase activation and large-scale DNA fragmentation (‘type II apoptosis’ as defined by Leist and Jäättelä ). We have provided evidence that this lack of caspase activation, despite the mitochondrial release of caspase-activating factors, is caused at least partially by a Ca2+-dependent, enforced degradation of caspase-activating factors (APAF-1, caspase-9 and caspase-3) during excitotoxic injury [17, 25, 26]. Very recent work has focused on the mechanism of excitotoxic injury in relation to mitochondrial and cellular bioenergetics and neuronal Ca2+ overloading . ΔΨm is a reliable indicator of mitochondrial bioenergetics. In an SFI-funded collaboration with SIEMENS Ireland, we developed an automated computational platform that interprets the single cell fluorescence of individual neurons for the cationic, voltage-sensitive dye tetramethylrhodamine methyl ester (TMRM) as a consequence of changes in either the ΔΨm or the plasma membrane potential (ΔΨp) (FIG. 1). We noted that during excitotoxic apoptosis, induced by transient glutamate receptor overactivation, cell death was preceded by a pronounced, sustained hyperpolarization of ΔΨm. This hyperpolarization was closely associated with significant increases in neuronal glucose uptake, NAD(P)H availability and ATP levels . Statistical analysis of ΔΨm changes at a single cell level revealed that those neurons with a more pronounced hyperpolarization of ΔΨm post glutamate exposure survived longer, and that neurons tolerant to a transient glutamate exposure showed the most significant increases . Hence the injury or tolerance induced by glutamate could be a function of the ATP availability within the cell, with any variability between outcomes dictated by each neuron’s ability to produce ATP. However, this and the relation of cellular bioenergetics to the activation of survival and cell death pathways warrants further investigation. Figure 1 Computational analysis of ΔΨm (solid line) and ΔΨp (dashed line) during excitotoxic injury. Parameter fitting for excitotoxic apoptosis (A), necrosis (B) and an intermediate, biphasic cell death (C). See Ward et al. (21) for further details. Representative TMRM traces and modelled changes in ΔΨm and ΔΨp for a neuron continuously exposed to glutamate (100 µM) (D), and for neurons undergoing apoptosis (E) or being tolerant (F) to a transient exposure to glutamate (100 µM, 5 min). ΔΨp alterations were confirmed using ΔΨp sensitive indicators (21). ER Stress- and Proteasomal Stress-Induced Cell Death: Intrigued by findings of the Paschen and Liu laboratories who observed ER stress and proteasomal dysfunction in ischaemic brain injury [15, 27], we also focused on the role of excitotoxicity-independent cell death signalling in the pathophysiology of cerebral ischaemia and chronic neurodegeneration. Disruption of protein folding and transport within the ER leads to the activation of a conserved response termed ER stress, culminating in the attenuation of protein synthesis and transcription of ER resident chaperones, such as Grp78. However, if the stress is prolonged or severe, apoptosis ensues. To identify genes and signalling pathways mediating ER stress-induced apoptosis, we characterized the transcriptome of SH-SY5Y neural cells treated with the ER stressor tunicamycin, an inhibitor of N-glycosylation . p53 upregulated mediator of apoptosis (puma), a Bcl-2 family protein was the most prominent pro-apoptotic gene induced. The Bcl-2 family proteins have emerged as key players in cellular life and death decisions by controlling the process of mitochondrial outer membrane permeabilisation (MOMP), leading to release of caspase-activating factor such as cytochrome-C and Smac/DIABLO. This process also triggers caspase-independent cell death forms . All members of the Bcl-2 family share homology within at least one and up to four Bcl-2 homology (BH) domains. PUMA is a member of the pro-apoptotic BH3 Only Protein subfamily, which exclusively possess the BH3 domain. These proteins are the major upstream initiators in the mitochondrial apoptosis pathway , transducing specific cellular stress signals to other Bcl-2 family members. Indeed, we could demonstrate that puma gene expression was both necessary and sufficient for inducing ER stress-mediated apoptosis . Although puma was identified as the major pro-apoptotic p53 target gene [30, 31], puma upregulation occurred independently of p53 during ER stress , a finding confirmed by the lack of other p53 (or p63/p73) target genes in our transcriptome profiling experiments. We also investigated the transcriptional response of neural cells during proteasomal inhibition and compared this response to the ER stress response. A model of proteasome inhibition induced apoptosis was established in SH-SY5Y neural cells by treatment with the selective 20 S proteasome inhibitor, epoxomicin . Consistent with the fact that the stress is occurring within the cytosol was the induction of cytosolic chaperones Hsp70 and Hsp27, and significantly an absence of induction of ER resident chaperones. In contrast, ER stress was associated with a downregulation of Hsp70 and a dramatic induction of Grp78 and Grp94. Importantly, proteasomal inhibition was also associated with the concomitant induction of two genes of the BH3 only family of proteins, puma and bim. In further studies, we could demonstrate that the transcription of puma was largely p53-dependent and partially mediated proteasomal inhibition-induced apoptosis. Surprisingly, however, despite significant bim gene activation and increased BIM protein levels, BIM was not required for proteasomal inhibition-induced apoptosis, even in the absence of PUMA expression . 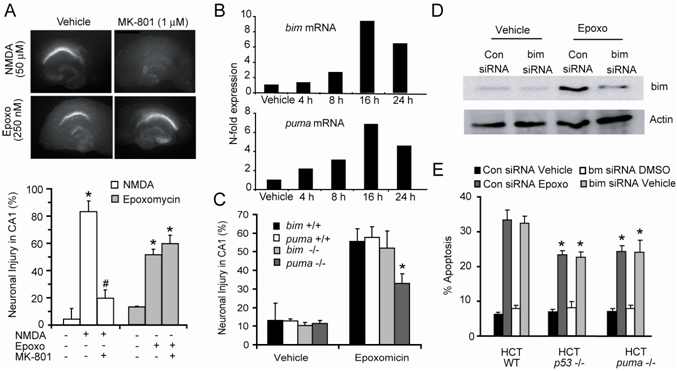 These data suggest that ER and proteasomal stress elicit similar, but mechanistically different responses, with PUMA expression a key factor involved in mediating cell death. Furthermore, these experiments provided a model scenario where BIM, despite significant transcriptional and translational induction, does not commit cells to apoptosis. We also translated our findings on a central role for PUMA in control of cell death caused by defects in protein quality control into a clinically relevant in vivo setting. Defects in protein quality control have been suggested to be a key event in ALS, a fatal neurodegenerative condition characterized by motoneuron degeneration. Using the SOD1G93A mouse model and human post mortem samples from patients with sporadic ALS, we could demonstrate evidence for increased ER stress, defects in protein degradation, and PUMA upregulation in motoneurons during disease progression . Genetic deletion of puma significantly improved motoneuron survival and delayed disease onset and motor dysfunction in SOD1G93A mice, but did not halt disease progression, suggesting a role for co-operating apoptotic or alternative cell death pathways in motoneuron degeneration. Indeed, in separate studies we could also identify a role of hypoxia-inducible and angiogenic factors in ALS [34, 35]. Real-Time Imaging of the Mitochondrial Apoptosis Pathway and Systems Biology Approaches: BH3 Only Proteins activate the pro-apoptotic Bax and Bak proteins, which are believed to physically form a release channels in the mitochondrial outer membrane during apoptosis. The activation of Bax and Bak involves protein translocation (Bax), conformational changes, membrane insertion, and oligomerisation. On the exisiting SFI grant, we have characterized the release of the pro-apoptotic proteins cytochrome-C and Smac/DIABLO in response to cellular stress. In HeLa cells and primary neurons the release of cytochrome-C and Smac/DIABLO (using confocal microscopy and GFP/YFP fusion proteins) occurred at similar time points during apoptosis, suggesting that MOMP is a rapid and central event, and caspase activation is not regulated via a selective release of individual mitochondrial proteins [36, 37]. We have also determined the kinetics of Bax activation, Bax-Bax interaction as well as the activation of the BH3 only protein, BID, in real-time during apoptosis employing confocal GFP and fluorescence resonance energy transfer (FRET) imaging techniques. In contrast to PUMA and BIM, the main mechanism of BID activation is a successive process of proteolytic activation into a truncated form (tBID), myristoylation and translocation to mitochondria, enabling a real-time analysis of its activation during apoptosis. Real-time imaging experiments using CFP-Bax/YFP-Bax and YFP-BID-CFP FRET systems as well as mathematical modelling of these processes suggested that already small quantities of active BH3 Only Proteins (tBID) or active Bax may be sufficient to trigger the process of MOMP during apoptosis [22, 37, 38]. Conversely, these experiments suggested that a key process in apoptosis induction is the formation of transcriptional or post-translational platforms to generate active BH3 Only Proteins. It will be important in the future to understand how these platforms are formed and which processes influence the activity of BH3 Only Proteins, as these may represent important therapeutic targets for the treatment of neurological and malignant disorders. The mitochondrial release of the pro-apoptotic factors cytochrome-C and Smac/DIABLO triggers the activation of caspases. We had earlier developed sensitive FRET assays to analyze the real-time kinetics of caspase activation quantitatively at the cellular level during apoptosis . In an extension of this work, we have used these skills to develop and validate mathematical models of apoptosis. In a SFI- and SIEMENS Ireland co-funded collaboration, we have built up a systems biology team aimed at understanding survival and death decision processes at a systems level. We developed a MATLAB-based model of cytochrome-C-induced effector caspase activation incorporating a 53 reaction network of ODEs and mass law kinetics ), which was sufficient to remodel the rapid kinetics of effector caspase activation observed in cells, and identify critical protein concentration thresholds required for the propagation of caspase activation . Single-cell experiments verified model predictions qualitatively and quantitatively . We have expanded these systems approaches to include the analysis of cell death control by Bcl-2 proteins [37,38], and have further implemented reaction-diffusion analysis and spatiotemporal signalling dynamics into these models . Objectives: The objective of this research programme is to identify key decision and intervention points relevant for ischaemic neuronal injury and chronic neurodegeneration using hypothesis-driven and systems-driven research approaches, with a particular emphasis on the role of BH3 Only Proteins and cellular and mitochondrial bioenergetics in cell death and cell survival signalling. Several earlier reports have described that overexpression of anti-apoptotic Bcl-2 family proteins can protect against the release of pro-apoptotic factors from mitochondria during excitotoxic neuronal injury, and rescue cells from excitotoxic cell death [42-44]. Because our previous studies indicated a critical role for BH3 Only Protein activation in mediating stress-induced apoptosis, we searched for the potential transcriptional activation of BH3 Only Proteins in our established excitotoxicity model systems. Interestingly, we could identify the BH3 Only Protein, BIM, as potently induced in response to glutamate and NMDA receptor overactivation (FIG. 2). Furthermore, preliminary studies pointed towards a critical role for BIM in mediating excitotoxic cell death. To analyse the contribution of bim to excitotoxic injury: In analogy to our previously described models in rat hippocampal neurons and cerebellar granule neurons, we have now developed murine excitotoxic cell culture systems in neocortical neurons (NMDA exposure) and motoneurons (AMPA exposure) amenable to the inclusion of genetically engineered mouse mutants, and relevant to the investigation of ischaemic stroke and motoneuron degeneration [33, 45]. Studies will involve the analysis of responses of wild-type (wt), heterozygous, and homozygous bim deficient mouse mutants provided and characterised by our collaborator Prof Andreas Strasser (WEHI, Melbourne, Australia; see Letter of Support) [46, 47]. To confirm findings, we will also employ bim gene silencing approaches using bim duplex siRNAs and lentiviral mediated expression of bim siRNA using pFIV-H1/U6 siRNA vectors established in our Gene Delivery Core funded through a Marie Curie Action grant from the European Union. Control experiments include the analysis of compensatory Bcl-2 family member gene regulation, glutamate receptor subunit expression, as well as quantitative analysis of the acute, NMDA- and AMPA-induced Ca2+ increases. Preliminary experiments in bim deficient neurons indicate no major differences in acute Ca2+ responses or compensatory gene regulation. Cell death endpoints will be analysed by cell survival double stain assays (PI/FDA) or a LDH release assay . Studies in neocortical neurons will be performed using three injury models: a model for acute injury preferentially inducing necrosis (continuous NMDA exposure, rapid injury within 10 to 30 min), a model of delayed excitotoxic apoptosis (5 min NMDA exposure, cell death onset within 4 to 24 h), and an intermediate model preferentially inducing a ‘biphasic’ cell death (10 min exposure to NMDA, leading to cell death and DCD typically within 30 to 120 min; see also FIG 1C). Figure 2. BIM is upregulated during excitotoxic injury and mediates cell death. (A) Model of delayed excitotoxic apoptosis induced by transient glutamate receptor excitation. Cerebellar granule neurons were preloaded with TMRM (30 nM) and Fluo-4 AM (3 µM), stimulated with 100 uM glutamate for 5 min, and monitored over time on a Zeiss LSM510 confocal microscope. Arrows indicate the delayed Ψm depolarization and the loss of Ca2+ homeostasis (DCD). (B) Transient glutamate excitation in cerebellar granule neurons results in a significant increase in bim mRNA expression revealed by qPCR. (C) Upper: Increase in BIMEL levels in primary cortical neurons exposed transiently to NMDA (5 min, 100 µM). Actin served as a loading control. Lower: Primary cortical neurons isolated from bim -/- mice are less vulnerable to transient NMDA exposure than those derived from bim +/+ mice. Apoptosis was evaluated using hoescht staining of nuclei. Data are means +/- SE from 7 experiments. (D) BimEL upregulation and protection of CA1 pyramidal neurons by bim-deficiency in murine organotypic hippocampal slice cultures exposed to NMDA (50 µM, 15 min). Propidium iodide staining was evaluated using MetaMorph software and plotted as a % of sham treated controls. Data are means +/- SE from 4 experiments in triplicate. To evaluate the contribution of BIM and Bcl-2 family proteins to mitochondrial bioenergetics and delayed Ca2+ deregulation during excitotoxic injury. The preliminary experiments described in FIG. 2 indicate an important role for transcriptional activation of the bim gene during excitotoxic cell death, but how this links to mitochondrial bioenergetics and Ca2+ homeostasis deregulation is unexplored. Delayed Ca2+ deregulation (DCD) has previously been shown to be the ultimate indicator of neuronal demise . Still, it is unclear whether DCD is triggered by mitochondrial dysfunction, or vice versa. Furthermore, the role of gene expression and Bcl-2 family proteins in this process remains uninvestigated. Here, we will investigate whether bim- or bax-deficient murine cortical neurons display differences in the onset or extent of acute and delayed mitochondrial depolarisation and DCD during excitotoxic apoptosis, necrosis, or during the intermediate, biphasic injury compared to wt neurons. We will here perform single-cell imaging experiments of Ca2+ levels using Fluo-4-based confocal imaging or using ratiometric indicators (in the case of long term experiments or volume changes), and will use the potential sensitive dyes TMRM and if required DiSBAC2(3) to determine changes in ΔΨm and ΔΨp . Single cell characterization of cellular and mitochondrial bioenergetics and their relation to excitotoxic injury. Acute glutamate excitation induces a rapid ATP depletion, presumably caused by an immediate ion homeostasis deregulation and the subsequent cellular attempt to re-establish ion gradients across biological membranes. Our previous studies have indicated significant differences in the ability of neurons to recover their bioenergetics following a transient or prolonged NMDA receptor activation, and have shown that the degree of ΔΨm hyperpolarisation in the recovery phase was an excellent indicator of neuronal survival . Here we will explore at the single-cell level the relationship between NAD(P)H levels and oxygen consumption with ΔΨm hyperpolarisation and neuronal survival. As NAD(P)H and FADH2 are the main substrates of the TCA cycle, real time characterisation of changes in their production and utilisation will enable us to monitor specific alterations in substrate availability for oxidative phosphorylation. We will carry out parallel analysis of NAD(P)H (ex 360 nm and em 420-480 nm band filter) and FADH2 (ex 458 nm and em 505-550 nm) autofluorescence over time whilst simultaneously monitoring changes in ΔΨm and ΔΨp. In an established collaboration with LUXCEL Biosciences, newly developed O2 sensing technologies [54-56] will be utilized to monitor mitochondrial respiration during NMDA-induced injury at the single cell level in the different injury paradigms and in relation to changes in changes in ΔΨm, ΔΨp, and survival. Neocortical neurons will be transfected or microinjected with PtCPK or PdCPK (ex 395 and 400 nm respectively, em lp filter 600 nm) and the fluorescence monitored over time following NMDA excitation. To explore the contribution of AMPK to survival responses. The AMP-activated protein kinase system (AMPK) has been identified as a critical regulator of cellular function in response to energy stress within the cell  and may be implicated in the alteration in cellular bioenergetics identified during excitotoxic injury. 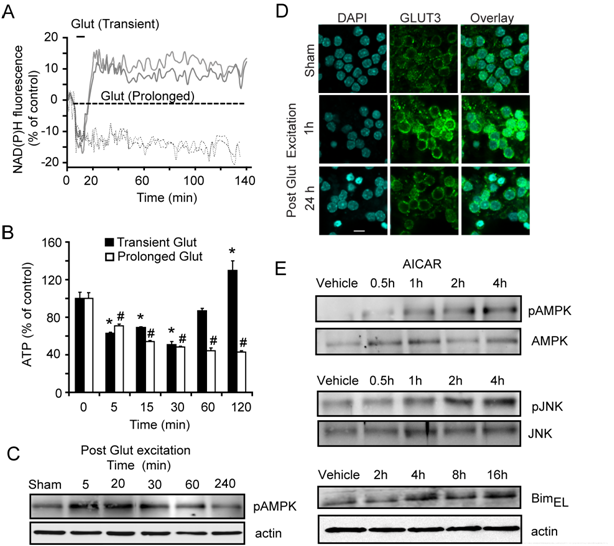 Modulations of AMPK activity results in key changes in cellular function with increased AMPK activity associated with the activation of catabolic pathways that generate ATP, with enhanced glucose uptake via different glucose transporter (GLUT) isoforms. Preliminary data from our laboratory could demonstrate an early activation of AMPK during excitotoxic apoptosis, and an increased activation and translocation of the neuron-specific GLUT3 isoform to the neuronal plasma membrane subsequent to this (FIG 3). Here we will test the hypothesis that AMPK signalling links energetic stress to the activation of these survival pathways. We will explore the effects of pharmacological AMPK activation and inhibition (activator AICAR and inhibitor compound C), gene inactivation of AMPKalpha and other subunits using RNA interference, as well as overexpression of constitutively-active (1-T172E AMPK ) and dominant-negative (1-D157A AMPK ) mutants using viral vectors on the modulation of GLUT 3 translocation and glucose uptake, NAD(P)H autofluorescence, and cell death activation. Studies will be performed in the three different models of excitotoxic injury. To explore the contribution of AMPK to bim gene activation. AMPK also shuts off ATP-consuming processes such as cell growth and proliferation . Evidence is accumulating that in doing so AMPK activation may also trigger cell death [60, 61]. Further preliminary experiments from our laboratory point to a potential cross-talk of prolonged AMPK activation and bim gene induction (FIG 3). Figure 3 Excitotoxic injury is associated with AMPK activation and rapid changes in cellular metabolism; implications for cell death signalling. Cerebellar granule neurons (CGNs) were either exposed continuously or transiently for 5 min to glutamate (100 µM) (A) Representative traces of NAD(P)H auto-fluorescence in CGNs following transient and prolonged glutamate excitation (B) Neuronal ATP levels in CGNs following transient and prolonged glutamate excitation (n = 4). (C) Increased phosphorylation of AMPK following transient glutamate excitation in CGNs. (D) Immunofluorescence analysis of GLUT-3 surface expression on CGNs following sham treatment (controls), and 1h and 24 h post transient glutamate excitation. Images representative of those from 3 separate experiments. (E) Increased phosphorylation of AMPK (Thr 172) and JNK1/2 (Thr183/Tyr185) and increased expression of BimEL in CGNs following incubation with the AMP mimetic and AMPK activator, AICAR. A prolonged AMPK activation with the pharmacological AMPK activator AICAR was sufficient to increase the levels of the BH3 Only Protein BIM (FIG 3) and to trigger cell death in 80-90% of neurons within 24-48 h. However, further experiments are required to evaluate the contribution of AMPK activation to apoptotic gene expression during excitotoxic injury. Using the tools described in Experimental Plan 2.2, we will investigate the role of AMPK activation in bim gene activation using reporter assays, qPCR and Western blotting experiments, and its effect on the phosphorylation status of BIM (note the potential shift in BIMEL mobility in FIGs. 2C and 3E). In our previous work, bim induction was analysed by qPCR, Western blotting, and luminometric bim promoter assays . All these studies have been conducted on the cell population level. However it is presently unknown (i) at which time point the transcriptional activation of pro-apoptotic genes occurs at the single cell level; (ii) whether bim gene induction occurs only in cells that subsequently die; (iii) how bim gene activation relates to the individual Ca2+ loads triggered by the glutamate receptor activation; (iv) how bim gene activation relates to cytoprotective responses (such as GLUT3 translocation, NAD(P)H generation, and Ψm hyperpolarisation); and (v) how bim gene activation and Ψm depolarisation/MOMP induction are timed. Single-cell analysis can provide key data on the sequence of molecular events, and generate quantitative temporal and spatial data for implementation in mathematical models. Using our expertise in the establishment of quantitative single-cell microscopy assays combined with our molecular and cell biology expertise, we will here address these important questions. For this, we will establish a GFP-based reporter systems for bim gene induction based on previously described reporter constructs  to perform a single-cell characterisation of bim gene activation in relation to the above parameters. These experiments will build on the ongoing single-cell promoter studies that are conducted in parallel in PROGRAMME 2. We will use GFP variants of different spectral properties and brightness, as well as stability, such as Cerulean, Venus, mRFP, and photo activatable GFP, suitable for the individual experimental design. Image data will be quantified at the single cell level to enable input into systems models. The image analysis will also be implemented into an automated set-up similar to protocols described previously . This will be performed in cooperation with SIEMENS, who collaborat on these automated work flow systems with our group. Reporter constructs will be introduced by lentiviral infection. In control experiments, the response of the GFP-based bim reporters will be compared to the response of endogenous bim gene. The data generated in these experiments will be used to implement and validate computational models of cell death activation and cell death cross talk during excitotoxic and Ca2+ mediated neuronal injury (Aim 4; PROGRAMME 2 Aim 5). Here we aim to provide a computational approach to qualitatively and quantitatively describe decision processes during excitotoxic and Ca2+ mediated neuronal injury. One of the biggest challenges here will be the generation of large-scale, standardised data sets, and the subsequent integration of heterogeneous data from different experimental approaches into computational frameworks. We will here apply the high content imaging and analysis platforms developed in our group. We will perform systematic large scale experiments varying extracellular glucose levels, using energy substrates bypassing glycolysis (pyruvate and leucine), modulating AMPK activity and GLUT3 expression using genetic and pharmacological means, and modulating bim and bax gene expression. Data generated include quantification of bioenergetics (NAD(P)H, Ψm), Ca2+ levels, bim gene activation, and cell death activation (PI uptake). A subsequent mathematical analysis will then be applied to distinguish those important parameters from redundant ones. In this respect the complexity of the data can be mathematically tackled by multivariate statistics analysis [72, 73]. This approach simplifies multi-dimensional data by identifying its principle components, as well predicting cellular responses to system perturbations using statistical regression procedures. Codes in MATLAB are available for this analysis. This approach will create regulation profiles for each cellular response that facilitate the identification of key players, and will allow cue-signal predictions to guide further hypothesis and model generation. It is possible, if not likely, that other cell survival and cell death pathways are activated during excitotoxic injury which co-operate with these pathways, or may predominate over these or substitute for them. These include Apoptosis-Inducing Factor (AIF) release, poly(ADP-ribose) polymerase-1 (PARP-1) activation as well as NAD(P)+ depletion [42, 74-77]. Therefore, we wish to develop a more comprehensive model of cell death cross talk during excitotoxic injury. Evidence of such a cross-talk already exists. AIF release can occur as a consequence of Bax/Bak-induced MOMP during apoptosis , hence bim or bax gene deletion may also reduce AIF release. However, a role for Ca2+-induced calpain and PARP-1 activation in mitochondrial AIF release has also been proposed . When activated, PARP-1 also consumes NAD+ to form poly(ADP-ribose) on acceptor proteins. PARP-1 activation during excitotoxic injury may also trigger cell death through a depletion of NAD+. Indeed, we have noted that excitotoxic necrosis induced by a prolonged glutamate receptor activation was associated with an irreversible decrease in cellular NAD(P)H autofluorescence [FIG 3A; ]. These data could argue for an involvement of NAD+ depletion preferentially during excitotoxic necrosis, but not excitotoxic apoptosis, unless the ‘overshooting’ of NAD(P)H further contributes to the depletion of NAD+ levels required for metabolic processes. AMP-activated protein kinase is furthermore a positive regulator of PARP . To address this complex interplay systematically, we will here apply multivariate statistics to identify the influence of these potential additional key determinants of cellular outcome using high content screening approaches that include the investigation of neocortical neurones from AIF- deficient harlequin mice, supplementation of neurones with NAD+, as well as knock-down of the NAD synthase nicotinamide mononucleotide adenylyltransferase (NMNAT) and PARP-1 genes. Subsequent multivariate analysis will help to establish profiles and pathways for mechanistic models of cross talk between these cell death pathways and their relation to neuronal survival. We have recently also presented a flux-based model of mitochondrial bioenergetics adapted from Beard and co-workers , comprising flux through the respiration chain, ATP production, passive and active ion membrane transport, and the electrophysiology of the mitochondrial membrane. We have modified this model so that it can be applied to excitotoxic processes and that predictions can be validated by single cell analyses such as NAD(P)H autofluorescence and TMRM-based fluorescence microscopy. In parallel to the approach described in 4.1, we will here expand this model and deliver an ODE-based systems model to identify key regulatory mechanisms and decision points subsequent to neuronal Ca2+ overloading and ATP depletion, including AMPK activation, cytoprotective signalling such as GLUT3 translocation, and apoptotic mechanisms like bim gene expression. Pending the outcome of the modelling experiments described in 4.2 it can be extended or adapted to include other processes. The model will provide a mechanistic and more detailed systemic insight into mitochondrial bioenergetics and cellular recovery and death after a bioenergetics crisis. We have previously described that PUMA expression was found to be necessary and sufficient for inducing cell death following disturbances in protein homeostasis, however, loss of puma expression resulted in only 50-75% rescue during ER stress and 50 % rescue during proteasomal stress [28, 32, 33] (FIG 4). Recently, a role for BIM has been identified during ER stress . In order to further delineate the role of BIM during ER stress, we will perform studies in bim deficient neurons as well as bim/puma deficient neurons. Owing to the difficulty in cross-breeding bim and puma deficient animals we will utilise gene silencing of bim and puma in the respective knock-out cells. In addition other BH3 Only Proteins or anti-apoptotic Bcl-2 family proteins may be important during ER stress- and during proteasome inhibition-induced apoptosis, and their role may also be investigated and compared to the effect of bax gene deficiency. These studies involve long term survival analysis of neocortical neurons exposed to ER stress (tunicamycin) and proteasome inhibition (epoxomicin, lactastatin) using cell death assays described in PROGRAMME 1. To insure that the gene knock-out or gene silencing experiments do not affect the levels of stress induced, the expression of Grp78 will be assessed in the ER stress model and Hsp70 levels in the proteasome inhibition model. Compensatory apoptotic gene regulation will also be investigated. Figure 4 Proteasomal stress is PUMA but not Bim sensitive. (A) Epoxomicin treatment of murine organotypic hippocampal slices induces a selective neuronal injury within the CA1 region which was MK-801 insensitive. (B) puma and bim mRNA levels analysed by qPCR following treatment of organotypic hippocampal slices with 250 nM epoxomicin. Data is normalised to actin expression. (C) puma -/- but not bim -/- slice cultures show reduced cell death in response to epoxomicin treatment. Data is from n = 5 experiments. (D) siRNA-mediated knockdown of Bim expression as assessed by Western blot (E) Silencing of Bim expression did not enhance cellular resistance against epoxo-induced cell death in PUMA -/- or p53 -/- HCT116 cells (32). The role of autophagy signalling pathways: The activation of autophagic pathways has been previously implicated with ER stress and inhibition of the proteasome as a back up mechanism to digest mis-folded or ubiquitin tagged proteins, and potentially to maintain cell survival [81-84]. We will examine the effects of silencing/knockout of the autophagy genes (Atg5, Atg7 and Atg12) in wild type and puma- as well as bax-deficient neocortical neurons during ER stress and proteasomal stress. We will investigate cell death endpoints (PI uptake) and will perform LC3-GFP imaging in real-time in relation to the onset of MOMP (using Smac-YFP). The effects of these stresses on mitochondrial bioenergetics, mitochondrial import, and the potential activation of mitophagy will be assessed using TMRM imaging, Western blotting of TIM23, and transmission electron microscopy [85, 86], initially in bax-deficient cells. In parallel, we will explore the consequence of the alterations on neuronal ATP levels and the activation of AMPK  and subsequent cell death. Furthermore, the potential role of PUMA or BIM in mediating displacement of Bcl-2 and Bcl-xL binding to Beclin will be examined. miRNA expression analysis during ER stress and proteasomal stress: There is increasing evidence that protein synthesis and mRNA degradation is also controlled by microRNAs (miRNAs). In collaboration with Prof. Ray Stallings (see Letter of Support) we will analyse the expression of miRNAs and their effects on gene regulation in SH-SY5Y cells exposed to tunicamycin and epoxomicin, using the mirVana miRNA probe set from Ambion and qPCR. Using a bioinformatics approach we will identify genes which could be potentially regulated by the identified differentially expressed miRNAs. The data generated in these experiments will be compared to the data sets that already exist for the mRNA transcriptome analysis in the SH-SY5Y cells exposed to tunicamycin and epoximicin [28,32]. This will provide us with important new clues that can explain the activation of apoptosis-activating transcription factors during ER and proteasomal stress. In preliminary studies we have identified at least 13 different miRNAs differentially expressed greater than 2 fold and up to 5-fold following a time course treatment with the ER stressor, tunicamycin. The functional significance of the differentially expressed miRNAs will be assessed by transfection with the appropriate precursor or inhibitor miRNA and their affects of putative gene targets assessed as well as their effects on cell survival/death. Selective vulnerability: In addition, we aim to translate these findings into the organotypic slice culture models of selective vulnerability to proteasome inhibition (FIG 4A). In order to delineate the differential sensitivity of the various regions of the hippocampus to proteasome inhibitors we will analysis the differences in the expression of the identified transcription factors and miRNAs in the various regions of the hippocampus following microdissection of the CA1, CA3 and dentate gyrus as shown earlier . Modulation of BIM function during proteasome inhibition: One of the most interesting finding in our preliminary studies was the fact that BIM was upregulated both transcriptionally and at a protein level, but that bim deficiency did not rescue cells from proteasome inhibition-induced apoptosis, in murine neocortical neurons, organotypic hippocampal slice cultures, and in cell lines, even in the absence of puma expression (FIG 4) . Similar results were obtained in models of 6-OHDA and arsenite-induced apoptosis by the Tolkovsky and Greene laboratories [89, 90]. All of these have in common that also cytoprotective pathways such as increased expression of Heat shock proteins (Hsps) are activated in parallel. Previous studies have demonstrated the cytoprotective effects of increased Hsp expression, notably Hsp70 and Hsp27 [91-94]. Their cytoprotective effects are attributed to their ability to modulate signalling effects both upstream and downstream of mitochondria, however, to date the upstream events are poorly characterised. Interestingly, preliminary experiments indicate that BIM may be chaperoned by Hsp27 induced during proteasomal stress (FIG 5A). To further characterise this interaction we will corroborate these findings and analyse the effects of depletion of Hsp27 versus Hsp70 in wild type, bim deficient, puma deficient and bim/puma deficient cells. Furthermore, we will examine the effects of HSF1 siRNA silencing as well as pharmacological inhibition in the previously described setting. This will reveal the important question on the role of Hsps in this model. Alternatively, we will also utilise the expertise of the Mass-spec core of the RCSI Research Institute in identifying new BIM binding partners during proteasomal stress using pull-down assays and liquid chromatography-mass spectroscopy (LC-MS/MS). Figure 5: (A) Co-immunoprecipitation of Hsp27 and BIM following inhibition of the proteasome. HCT cells were treated epoxomicin (50 nM) for 16 or 24 h. Immunoprecipitaion was performed with either Hsp70 (H70), Hsp27 (H27) or BIM antibody and subsequent Western blotting with an anti-Hsp27 antibody (B) HCT116 cells stably expressing EGFP under the control of the Hsp70 promoter. Cells were treated with 50 nM epoxomicin and imaged via epifluorescent microscopy at indicated intervals. (C) A representative trace of a cell treated with 50 nM epoxomicin and the expression of EGFP monitored over time. Identification of novel binding partners of BIM and PUMA using protein arrays. In this approach, the sequences of the PUMA and BIM proteins will be prepared as series of 25-mer peptides, overlapping by 5 residues at both N- and C-termini. For regions encompassing difficult combinations of amino-acids, the length of these peptides will be reduced to 21 residues to ensure maximal integrity of the corresponding sequences. Specific regions of interest, such as the BH3 domain, will also be synthesized as central sequences and flanking residues will be appended to reach the average length of 25 residues to favour secondary structure formation. These peptides will be modified by N-terminal biotinylation to allow their use in pull-down assays and detection on protein microarrays. This will be done in collaboration with Dr Marc Devocelle (see Letter of Support). Alternatively, GST- or His-tagged protein fragments of PUMA and BIM will be analysed. These protein array-based technologies have been previously established in the RCSI Centre for Human Proteomics. The PEX array (Imagenes GmbH) contains 12,000 different bacterially expressed human His-tagged proteins on PVDF membranes, the Protoarray (Invitrogen) contains 8,000 full length baculuvirus expressed human GST-tagged proteins arrayed on glass slides. All recombinant proteins used are fully annotated. Putative binding partners for BIM and PUMA can readily be expressed and purified for further binding studies, e.g. coIP, and where necessary as antigens for the production of antibodies. In preliminary experiments, we could identify c-SKI binding to a peptide corresponding to amino-acids 132-157 which contains the BH3-domain of PUMA (FIG 6B). We will further investigate this observation by performing immunoprecipiation experiments with both PUMA and c-Ski, as well as investigating the ability of c-Ski to modulate PUMA-dependent apoptosis (FIG 6C). Follow up experiments of newly identified binding partners include expression analysis, knock-down and knock-out experiments and overexpression studies. Further studies will involve use of GFP fusion constructs for localisation studies and potentially FRET-based interaction studies. These studies will initially be performed and optimised in human cells (HCT puma-/- and SH-SY5Y), and then confirmed in neocortical neurons in both the ER and proteasomal stress models as well as excitotoxicity injury paradigm. These studies will identify novel regulators of the pro-apoptotic activity of two key BH3 Only Proteins and potentially also reveal new roles of PUMA and BIM in cell signalling. Figure 6: (A) Schematic diagram depicting the sequence of events when performing a protein macroarray experiment. (B) Macroarray performed with a 30 amino acid peptide sequence of the PUMA protein. Inset depicts the signal from the array corresponding to binding of the PUMA peptide to cSki. (C) Co-immunoprecipiation of PUMA and cSki proteins. DU145 cells were transfected with equal amounts of HA-PUMA and cSki expressing vectors. Immunoprecipitation was performed with the HA antibody and subsequent Western blotting with the cSki antibody. (D) Overexpression of cSki inhibits cell death induced via PUMA dependent stimuli. SHEP neuroblastoma cells stability expressing cSki or empty vector were treated with 50 nM epoxomicin (Epoxo), 1 mM thapsigargin (Thapsi) or 3 mM tunicamycin (Tuni) for 32 h. Cell death was assessed via the ability to exclude propidium iodide as analysed by flow cytometry. * p<0.05 compared to empty vector control. The model and data generated will be used to implement and validate a general model of BH3 Only Protein activation, using the qualitative and quantitative single-cell imaging data on the transcriptional activation of BH3 Only Proteins as well as published protein interaction and protein expression data. An ODE-based model will be established and furthermore integrated into our existing model of cytochrome-C induced effector caspase activation . As our preliminary data indicate that stochastic processes can potentially not be ignored during MOMP formation [22, 37, 38] alternatively a model based on cellular automata (CA)  will be modified which integrates biochemical and diffusion processes on the mitochondrial membrane and therefore also includes stochastic processes. The data generated in the single cell imaging of gene activation will also be utilised to generate an ODE based computational model to study cell survival and cell death decision processes during ER stress and proteasomal inhibition. For example, during proteasomal stress we will use the activation of HSF-1 and p53 as input signals, expression and interaction of Hsp70, Hsp27, PUMA and BIM as cell signalling network, and cell survival or cell death as output signal. Using bistability analysis, a control-theory technique for determining stability, decision switches and associated regulators, will enable us to elucidate the transition between cytoprotective and apoptotic pathways and determine the critical factors in the regulation thereof. Model predictions will be validated through our established single cell reporter systems. Finally, we aim to integrate different stress stimuli, namely excitotoxic/bioenergetic stress, ER stress and proteasomal stress into a single comprehensive computational model by integrating the different contributions of stress signal initiators (AMPK, HSF-1, p53, ATF-6) and their effectors into one computational framework. Aim 6: To translate key research findings of the hypothesis-driven and systems-driven research approaches on cell death activation and cell death cross talk into disease models of ischaemic stroke and motoneuron degeneration. In further developments of the current research programme, we have established organotypic hippocampal slice culture models of oxygen-glucose deprivation-induced injury, as well as in vivo models of excitotoxic (stereotactic intrahippocampal NMDA injections) and ischemia-induced (transient middle cerebral artery occlusion, tMCAO) injury in mice . In the latter model, a Laser-Doppler controlled tMCAO is achieved by advancing a nylon filament into the MCA for 60 minutes, and then retracting the filament to allow for reperfusion. The two in vivo models were established through secondment of neurosurgeons (Dr Katsura Kuroki and Dr Takuro Tsuchiyama) from the Department of Neurosurgery, Mie University, Japan, into our research programme. In the organotypic slice culture model and the in vivo models, we will test new core hypotheses generated during the time course of this research programme, employing gene deficient animals, administration of pharmacological inhibitors and activators, as well as lentiviral expression in combination with stereotactic delivery systems. Analysis will include tissue mRNA and protein expression analysis in vulnerable vs. resistant brain regions, histopathological analysis of tissue injury including triphenytetrazolium chloride (TTC) and TUNEL staining techniques, as well as functional outcome analysis using a neurological deficit scoring system and motor function tests. All surgical equipment and motor and behavioural testing equipment have been established in the group. In the organotypic hippocampal slice cultures we will harness the advantage of microscopy to be able to distinguish between different cell types during live cell experiments, and to measure cells in a more ‘natural’ environment. Similarly, it will be important to determine whether these processes also contribute to chronic neurodegeneration. Excitotoxic and Ca2+ mediated neuronal injury, but also local reductions in blood flow have been implicated in the pathophysiology of ALS. We will here employ the previously investigated model of motoneuron degeneration in SOD1G93A mice . In vivo studies include gene and protein expression analysis, survival studies, histopathological as well as functional analyses of motor function (rotarod test, paw grip endurance test, foot print analysis, body weight analysis) . A particular emphasis in these in vivo systems will lie on the local and cellular activation of stress signalling through AMPK and its relation to the activation of BH3 Only Proteins. We will integrate the R&D activities of LUXCEL Biosciences, a pioneer in oxygen sensing technologies, into the programme. The LUXCEL activities include the application and development of extracellular and intracellular oxygen sensors for hypothesis-driven research, high-content analysis and microscopy-based applications, as well as the development of multiplexing platforms. Likewise, expertise and previous accomplishments in high-content analysis, image analysis and cellular pathway modelling resulting from the established, SFI-funded academia-industry partnership with SIEMENS will merge with our activities. The SIEMENS activities in this programme include (i) Diagnostics and work flow systems for in-vitro and in-vivo analyses that provide response characterisation and parallel statistical evaluation of cellular processes, (ii) High content & modelling platforms for single cell research approaches. These approaches integrate biophysical modelling, equipment automation, image analysis and event driven process control, and (iii) Web-based tools for providing interworking between in-silico, experimental and clinical researchers. The recognised expertise of SIEMENS in software development and project management and the expertise of LUXCEL in sensor development will be mutually beneficial, and accelerate the discovery process but also the commercialisation of research findings. 1. Mattson MP. (2007) Calcium and neurodegeneration. Aging Cell, 6, 337-50. 2. Choi DW. (1987) Ionic dependence of glutamate neurotoxicity. J Neurosci, 7, 369-79. 3. Bano D, Nicotera P. (2007) Ca2+ signals and neuronal death in brain ischemia. Stroke, 38, 674-6. 4. Aarts M, Iihara K, Wei WL, Xiong ZG, Arundine M, Cerwinski W, MacDonald JF, Tymianski M. (2003) A key role for TRPM7 channels in anoxic neuronal death. Cell, 115, 863-77. 5. Xiong ZG, Zhu XM, Chu XP, Minami M, Hey J, Wei WL, MacDonald JF, Wemmie JA, Price MP, Welsh MJ, Simon RP. (2004) Neuroprotection in ischemia: blocking calcium-permeable acid-sensing ion channels. Cell, 118, 687-98. 6. Bano D, Young KW, Guerin CJ, Lefeuvre R, Rothwell NJ, Naldini L, Rizzuto R, Carafoli E, Nicotera P. (2005) Cleavage of the plasma membrane Na+/Ca2+ exchanger in excitotoxicity. Cell, 120, 275-85. 7. Bruijn LI, Miller TM, Cleveland DW. (2004) Unraveling the mechanisms involved in motor neuron degeneration in ALS. Annu Rev Neurosci, 27, 723-49. 8. Araki T, Sasaki Y, Milbrandt J. (2004) Increased nuclear NAD biosynthesis and SIRT1 activation prevent axonal degeneration. Science, 305, 1010-3. 9. Eliasson MJ, Sampei K, Mandir AS, Hurn PD, Traystman RJ, Bao J, Pieper A, Wang ZQ, Dawson TM, Snyder SH, Dawson VL. (1997) Poly(ADP-ribose) polymerase gene disruption renders mice resistant to cerebral ischemia. Nat Med, 3, 1089-95. 10. Nicholls DG, Budd SL. (2000) Mitochondria and neuronal survival. Physiol Rev, 80, 315-60. 11. Sadanaga-Akiyoshi F, Yao H, Tanuma S, Nakahara T, Hong JS, Ibayashi S, Uchimura H, Fujishima M. (2003) Nicotinamide attenuates focal ischemic brain injury in rats: with special reference to changes in nicotinamide and NAD+ levels in ischemic core and penumbra. Neurochem Res, 28, 1227-34. 12. Zhai RG, Zhang F, Hiesinger PR, Cao Y, Haueter CM, Bellen HJ. (2008) NAD synthase NMNAT acts as a chaperone to protect against neurodegeneration. Nature. 13. Bossy-Wetzel E, Schwarzenbacher R, Lipton SA. (2004) Molecular pathways to neurodegeneration. Nat Med, 10 Suppl, S2-9. 14. Paschen W, Mengesdorf T. (2005) Endoplasmic reticulum stress response and neurodegeneration. Cell Calcium, 38, 409-15. 15. Hu BR, Martone ME, Jones YZ, Liu CL. (2000) Protein aggregation after transient cerebral ischemia. J Neurosci, 20, 3191-9. 16. Kroemer G, Galluzzi L, Brenner C. (2007) Mitochondrial membrane permeabilization in cell death. Physiol Rev, 87, 99-163. 17. Lankiewicz S, Marc Luetjens C, Truc Bui N, Krohn AJ, Poppe M, Cole GM, Saido TC, Prehn JH. (2000) Activation of calpain I converts excitotoxic neuron death into a caspase-independent cell death. J Biol Chem, 275, 17064-71. 18. Luetjens CM, Bui NT, Sengpiel B, Munstermann G, Poppe M, Krohn AJ, Bauerbach E, Krieglstein J, Prehn JH. (2000) Delayed mitochondrial dysfunction in excitotoxic neuron death: cytochrome c release and a secondary increase in superoxide production. J Neurosci, 20, 5715-23. 19. Prehn JH. (1998) Mitochondrial transmembrane potential and free radical production in excitotoxic neurodegeneration. Naunyn Schmiedebergs Arch Pharmacol, 357, 316-22. 20. Sengpiel B, Preis E, Krieglstein J, Prehn JH. (1998) NMDA-induced superoxide production and neurotoxicity in cultured rat hippocampal neurons: role of mitochondria. Eur J Neurosci, 10, 1903-10. 21. Ward MW, Huber HJ, Weisova P, Dussmann H, Nicholls DG, Prehn JH. (2007) Mitochondrial and plasma membrane potential of cultured cerebellar neurons during glutamate-induced necrosis, apoptosis, and tolerance. J Neurosci, 27, 8238-49. 22. Ward MW, Rehm M, Duessmann H, Kacmar S, Concannon CG, Prehn JH. (2006) Real time single cell analysis of Bid cleavage and Bid translocation during caspase-dependent and neuronal caspase-independent apoptosis. J Biol Chem, 281, 5837-44. 23. Konig HG, Rehm M, Gudorf D, Krajewski S, Gross A, Ward MW, Prehn JH. (2007) Full length Bid is sufficient to induce apoptosis of cultured rat hippocampal neurons. BMC Cell Biol, 8, 7. 24. Leist M, Jaattela M. (2001) Four deaths and a funeral: from caspases to alternative mechanisms. Nat Rev Mol Cell Biol, 2, 589-98. 25. Chua BT, Guo K, Li P. (2000) Direct cleavage by the calcium-activated protease calpain can lead to inactivation of caspases. J Biol Chem, 275, 5131-5. 26. Reimertz C, Kogel D, Lankiewicz S, Poppe M, Prehn JH. (2001) Ca(2+)-induced inhibition of apoptosis in human SH-SY5Y neuroblastoma cells: degradation of apoptotic protease activating factor-1 (APAF-1). J Neurochem, 78, 1256-66. 27. Paschen W, Doutheil J. (1999) Disturbances of the functioning of endoplasmic reticulum: a key mechanism underlying neuronal cell injury? J Cereb Blood Flow Metab, 19, 1-18. 28. Reimertz C, Kogel D, Rami A, Chittenden T, Prehn JH. (2003) Gene expression during ER stress-induced apoptosis in neurons: induction of the BH3-only protein Bbc3/PUMA and activation of the mitochondrial apoptosis pathway. J Cell Biol, 162, 587-97. 29. Labi V, Erlacher M, Kiessling S, Villunger A. (2006) BH3-only proteins in cell death initiation, malignant disease and anticancer therapy. Cell Death Differ, 13, 1325-38. 30. Nakano K, Vousden KH. (2001) PUMA, a novel proapoptotic gene, is induced by p53. Mol Cell, 7, 683-94. 31. Yu J, Zhang L, Hwang PM, Kinzler KW, Vogelstein B. (2001) PUMA induces the rapid apoptosis of colorectal cancer cells. Mol Cell, 7, 673-82. 32. Concannon CG, Koehler BF, Reimertz C, Murphy BM, Bonner C, Thurow N, Ward MW, Villunger A, Strasser A, Kogel D, Prehn JH. (2007) Apoptosis induced by proteasome inhibition in cancer cells: predominant role of the p53/PUMA pathway. Oncogene, 26, 1681-92. 33. Kieran D, Woods I, Villunger A, Strasser A, Prehn JH. (2007) Deletion of the BH3-only protein puma protects motoneurons from ER stress-induced apoptosis and delays motoneuron loss in ALS mice. Proc Natl Acad Sci U S A, 104, 20606-11. 34. Kieran D, Greenway MJ, Concannon CG, Connaughton D, Fenner B, Hardiman O, Prehn JHM. (2008) Control of motoneuron survival by angiogenin. J Neurosci, in revision. 35. Greenway MJ, Andersen PM, Russ C, Ennis S, Cashman S, Donaghy C, Patterson V, Swingler R, Kieran D, Prehn J, Morrison KE, Green A, Acharya KR, Brown RH, Jr., Hardiman O. (2006) ANG mutations segregate with familial and ‘sporadic’ amyotrophic lateral sclerosis. Nat Genet, 38, 411-3. 36. Rehm M, Dussmann H, Prehn JH. (2003) Real-time single cell analysis of Smac/DIABLO release during apoptosis. J Cell Biol, 162, 1031-43. 37. Rehm M, Huber HJ, C H, Duessmann H, Prehn JHM. (2008) Reaction-Diffusion Analysis of Spatiotemporal Signaling Dynamics during Apoptosis Execution. Molecular Systems Biology, In submission. 38. Duessmann H, Rehm M, Huber HJ, Kacmar S, Voller P, Wuerstle M, Concannon CG, Anguissola S, Prehn JHM. (2008) Single cell kinetics of pre-mitochondrial apoptotic signalling: Translocation and Oligomerisation of Bax. in preparation. 39. Rehm M, Dussmann H, Janicke RU, Tavare JM, Kogel D, Prehn JH. (2002) Single-cell fluorescence resonance energy transfer analysis demonstrates that caspase activation during apoptosis is a rapid process. Role of caspase-3. J Biol Chem, 277, 24506-14. 40. Huber HJ, Rehm M, Plchut M, Dussmann H, Prehn JH. (2007) APOPTO-CELL–a simulation tool and interactive database for analyzing cellular susceptibility to apoptosis. Bioinformatics, 23, 648-50. 41. Rehm M, Huber HJ, Dussmann H, Prehn JH. (2006) Systems analysis of effector caspase activation and its control by X-linked inhibitor of apoptosis protein. EMBO J, 25, 4338-49. 42. Wang H, Yu SW, Koh DW, Lew J, Coombs C, Bowers W, Federoff HJ, Poirier GG, Dawson TM, Dawson VL. (2004) Apoptosis-inducing factor substitutes for caspase executioners in NMDA-triggered excitotoxic neuronal death. J Neurosci, 24, 10963-73. 43. Dietz GP, Dietz B, Bahr M. (2007) Bcl-xL protects cerebellar granule neurons against the late phase, but not against the early phase of glutamate-induced cell death. Brain Res, 1164, 136-41. 44. Semenova MM, Maki-Hokkonen AM, Cao J, Komarovski V, Forsberg KM, Koistinaho M, Coffey ET, Courtney MJ. (2007) Rho mediates calcium-dependent activation of p38alpha and subsequent excitotoxic cell death. Nat Neurosci, 10, 436-43. 45. Concannon CG, Ward MW, Bonner HP, Kuroki K, Tuffy LP, Bonner CT, Woods I, Engel T, Henshall DC, Prehn JH. (2008) NMDA receptor-mediated excitotoxic neuronal apoptosis in vitro and in vivo occurs in an ER stress and PUMA independent manner. J Neurochem. 46. Bouillet P, Metcalf D, Huang DC, Tarlinton DM, Kay TW, Kontgen F, Adams JM, Strasser A. (1999) Proapoptotic Bcl-2 relative Bim required for certain apoptotic responses, leukocyte homeostasis, and to preclude autoimmunity. Science, 286, 1735-8. 47. Puthalakath H, O’Reilly LA, Gunn P, Lee L, Kelly PN, Huntington ND, Hughes PD, Michalak EM, McKimm-Breschkin J, Motoyama N, Gotoh T, Akira S, Bouillet P, Strasser A. (2007) ER stress triggers apoptosis by activating BH3-only protein Bim. Cell, 129, 1337-49. 48. Plesnila N, Zinkel S, Le DA, Amin-Hanjani S, Wu Y, Qiu J, Chiarugi A, Thomas SS, Kohane DS, Korsmeyer SJ, Moskowitz MA. (2001) BID mediates neuronal cell death after oxygen/ glucose deprivation and focal cerebral ischemia. Proc Natl Acad Sci U S A, 98, 15318-23. 49. Kaufmann T, Tai L, Ekert PG, Huang DC, Norris F, Lindemann RK, Johnstone RW, Dixit VM, Strasser A. (2007) The BH3-only protein bid is dispensable for DNA damage- and replicative stress-induced apoptosis or cell-cycle arrest. Cell, 129, 423-33. 50. Nicholls DG, Budd SL. (1998) Mitochondria and neuronal glutamate excitotoxicity. Biochim Biophys Acta, 1366, 97-112. 51. Scorrano L, Ashiya M, Buttle K, Weiler S, Oakes SA, Mannella CA, Korsmeyer SJ. (2002) A distinct pathway remodels mitochondrial cristae and mobilizes cytochrome c during apoptosis. Dev Cell, 2, 55-67. 52. Boehning D, Patterson RL, Sedaghat L, Glebova NO, Kurosaki T, Snyder SH. (2003) Cytochrome c binds to inositol (1,4,5) trisphosphate receptors, amplifying calcium-dependent apoptosis. Nat Cell Biol, 5, 1051-61. 53. Copanaki E, Schurmann T, Eckert A, Leuner K, Muller WE, Prehn JH, Kogel D. (2007) The amyloid precursor protein potentiates CHOP induction and cell death in response to ER Ca2+ depletion. Biochim Biophys Acta, 1773, 157-65. 54. O’Riordan TC, Fitzgerald K, Ponomarev GV, Mackrill J, Hynes J, Taylor C, Papkovsky DB. (2007) Sensing intracellular oxygen using near-infrared phosphorescent probes and live-cell fluorescence imaging. Am J Physiol Regul Integr Comp Physiol, 292, R1613-20. 55. Will Y, Hynes J, Ogurtsov VI, Papkovsky DB. (2006) Analysis of mitochondrial function using phosphorescent oxygen-sensitive probes. Nat Protoc, 1, 2563-72. 56. Zhdanov AV, Ward MW, Prehn JH, Papkovsky DB. (2008) Dynamics of intracellular oxygen in PC12 Cells upon stimulation of neurotransmission. J Biol Chem, 283, 5650-61. 57. Hardie DG, Hawley SA, Scott JW. (2006) AMP-activated protein kinase–development of the energy sensor concept. J Physiol, 574, 7-15. 58. Woods A, Vertommen D, Neumann D, Turk R, Bayliss J, Schlattner U, Wallimann T, Carling D, Rider MH. (2003) Identification of phosphorylation sites in AMP-activated protein kinase (AMPK) for upstream AMPK kinases and study of their roles by site-directed mutagenesis. J Biol Chem, 278, 28434-42. 59. Stein SC, Woods A, Jones NA, Davison MD, Carling D. (2000) The regulation of AMP-activated protein kinase by phosphorylation. Biochem J, 345 Pt 3, 437-43. 60. Hallstrom TC, Mori S, Nevins JR. (2008) An E2F1-dependent gene expression program that determines the balance between proliferation and cell death. Cancer Cell, 13, 11-22. 61. Okoshi R, Ozaki T, Yamamoto H, Ando K, Koida N, Ono S, Koda T, Kamijo T, Nakagawara A, Kizaki H. (2008) Activation of AMP-activated protein kinase induces p53-dependent apoptotic cell death in response to energetic stress. J Biol Chem, 283, 3979-87. 62. Hay N, Sonenberg N. (2004) Upstream and downstream of mTOR. Genes Dev, 18, 1926-45. 63. Wang X, Beugnet A, Murakami M, Yamanaka S, Proud CG. (2005) Distinct signaling events downstream of mTOR cooperate to mediate the effects of amino acids and insulin on initiation factor 4E-binding proteins. Mol Cell Biol, 25, 2558-72. 64. Graber TE, Holcik M. (2007) Cap-independent regulation of gene expression in apoptosis. Mol Biosyst, 3, 825-34. 65. Li S, Sonenberg N, Gingras AC, Peterson M, Avdulov S, Polunovsky VA, Bitterman PB. (2002) Translational control of cell fate: availability of phosphorylation sites on translational repressor 4E-BP1 governs its proapoptotic potency. Mol Cell Biol, 22, 2853-61. 66. Jacinto E, Facchinetti V, Liu D, Soto N, Wei S, Jung SY, Huang Q, Qin J, Su B. (2006) SIN1/MIP1 maintains rictor-mTOR complex integrity and regulates Akt phosphorylation and substrate specificity. Cell, 127, 125-37. 67. Sarbassov DD, Guertin DA, Ali SM, Sabatini DM. (2005) Phosphorylation and regulation of Akt/PKB by the rictor-mTOR complex. Science, 307, 1098-101. 68. Gilley J, Coffer PJ, Ham J. (2003) FOXO transcription factors directly activate bim gene expression and promote apoptosis in sympathetic neurons. J Cell Biol, 162, 613-22. 69. Kefas BA, Cai Y, Ling Z, Heimberg H, Hue L, Pipeleers D, Van de Casteele M. (2003) AMP-activated protein kinase can induce apoptosis of insulin-producing MIN6 cells through stimulation of c-Jun-N-terminal kinase. J Mol Endocrinol, 30, 151-61. 70. Jhun BS, Lee JY, Oh YT, Lee JH, Choe W, Baik HH, Kim SS, Yoon KS, Ha J, Kang I. (2006) Inhibition of AMP-activated protein kinase suppresses IL-2 expression through down-regulation of NF-AT and AP-1 activation in Jurkat T cells. Biochem Biophys Res Commun, 351, 986-92. 71. Centeno C, Repici M, Chatton JY, Riederer BM, Bonny C, Nicod P, Price M, Clarke PG, Papa S, Franzoso G, Borsello T. (2007) Role of the JNK pathway in NMDA-mediated excitotoxicity of cortical neurons. Cell Death Differ, 14, 240-53. 72. Gaudet S, Janes KA, Albeck JG, Pace EA, Lauffenburger DA, Sorger PK. (2005) A compendium of signals and responses triggered by prodeath and prosurvival cytokines. Mol Cell Proteomics, 4, 1569-90. 73. Janes KA, Gaudet S, Albeck JG, Nielsen UB, Lauffenburger DA, Sorger PK. (2006) The response of human epithelial cells to TNF involves an inducible autocrine cascade. Cell, 124, 1225-39. 74. Cheung EC, Melanson-Drapeau L, Cregan SP, Vanderluit JL, Ferguson KL, McIntosh WC, Park DS, Bennett SA, Slack RS. (2005) Apoptosis-inducing factor is a key factor in neuronal cell death propagated by BAX-dependent and BAX-independent mechanisms. J Neurosci, 25, 1324-34. 75. Culmsee C, Zhu C, Landshamer S, Becattini B, Wagner E, Pellecchia M, Blomgren K, Plesnila N. (2005) Apoptosis-inducing factor triggered by poly(ADP-ribose) polymerase and Bid mediates neuronal cell death after oxygen-glucose deprivation and focal cerebral ischemia. J Neurosci, 25, 10262-72. 76. Yu SW, Andrabi SA, Wang H, Kim NS, Poirier GG, Dawson TM, Dawson VL. (2006) Apoptosis-inducing factor mediates poly(ADP-ribose) (PAR) polymer-induced cell death. Proc Natl Acad Sci U S A, 103, 18314-9. 77. Yu SW, Wang H, Poitras MF, Coombs C, Bowers WJ, Federoff HJ, Poirier GG, Dawson TM, Dawson VL. (2002) Mediation of poly(ADP-ribose) polymerase-1-dependent cell death by apoptosis-inducing factor. Science, 297, 259-63. 78. Cao G, Xing J, Xiao X, Liou AK, Gao Y, Yin XM, Clark RS, Graham SH, Chen J. (2007) Critical role of calpain I in mitochondrial release of apoptosis-inducing factor in ischemic neuronal injury. J Neurosci, 27, 9278-93. 79. Walker JW, Jijon HB, Madsen KL. (2006) AMP-activated protein kinase is a positive regulator of poly(ADP-ribose) polymerase. Biochem Biophys Res Commun, 342, 336-41. 80. Beard DA. (2005) A biophysical model of the mitochondrial respiratory system and oxidative phosphorylation. PLoS Comput Biol, 1, e36. 81. Hoyer-Hansen M, Jaattela M. (2007) Connecting endoplasmic reticulum stress to autophagy by unfolded protein response and calcium. Cell Death Differ, 14, 1576-82. 82. Ogata M, Hino S, Saito A, Morikawa K, Kondo S, Kanemoto S, Murakami T, Taniguchi M, Tanii I, Yoshinaga K, Shiosaka S, Hammarback JA, Urano F, Imaizumi K. (2006) Autophagy is activated for cell survival after endoplasmic reticulum stress. Mol Cell Biol, 26, 9220-31. 83. Ullman E, Fan Y, Stawowczyk M, Chen HM, Yue Z, Zong WX. (2008) Autophagy promotes necrosis in apoptosis-deficient cells in response to ER stress. Cell Death Differ, 15, 422-5. 84. Yorimitsu T, Nair U, Yang Z, Klionsky DJ. (2006) Endoplasmic reticulum stress triggers autophagy. J Biol Chem, 281, 30299-304. 85. Goemans CG, Boya P, Skirrow CJ, Tolkovsky AM. (2008) Intra-mitochondrial degradation of Tim23 curtails the survival of cells rescued from apoptosis by caspase inhibitors. Cell Death Differ, 15, 545-54. 86. Xue L, Fletcher GC, Tolkovsky AM. (2001) Mitochondria are selectively eliminated from eukaryotic cells after blockade of caspases during apoptosis. Curr Biol, 11, 361-5. 87. Hoyer-Hansen M, Jaattela M. (2007) AMP-activated protein kinase: a universal regulator of autophagy? Autophagy, 3, 381-3. 88. Hatazaki S, Bellver-Estelles C, Jimenez-Mateos EM, Meller R, Bonner C, Murphy N, Matsushima S, Taki W, Prehn JH, Simon RP, Henshall DC. (2007) Microarray profile of seizure damage-refractory hippocampal CA3 in a mouse model of epileptic preconditioning. Neuroscience, 150, 467-77. 89. Biswas SC, Ryu E, Park C, Malagelada C, Greene LA. (2005) Puma and p53 play required roles in death evoked in a cellular model of Parkinson disease. Neurochem Res, 30, 839-45. 90. Wong HK, Fricker M, Wyttenbach A, Villunger A, Michalak EM, Strasser A, Tolkovsky AM. (2005) Mutually exclusive subsets of BH3-only proteins are activated by the p53 and c-Jun N-terminal kinase/c-Jun signaling pathways during cortical neuron apoptosis induced by arsenite. Mol Cell Biol, 25, 8732-47. 91. Concannon CG, Gorman AM, Samali A. (2003) On the role of Hsp27 in regulating apoptosis. Apoptosis, 8, 61-70. 92. Garrido C, Brunet M, Didelot C, Zermati Y, Schmitt E, Kroemer G. (2006) Heat shock proteins 27 and 70: anti-apoptotic proteins with tumorigenic properties. Cell Cycle, 5, 2592-601. 93. Jaattela M, Wissing D. (1993) Heat-shock proteins protect cells from monocyte cytotoxicity: possible mechanism of self-protection. J Exp Med, 177, 231-6. 94. Ravagnan L, Gurbuxani S, Susin SA, Maisse C, Daugas E, Zamzami N, Mak T, Jaattela M, Penninger JM, Garrido C, Kroemer G. (2001) Heat-shock protein 70 antagonizes apoptosis-inducing factor. Nat Cell Biol, 3, 839-43. 95. Chen C, Cui J, Zhang W, Shen P. (2007) Robustness analysis identifies the plausible model of the Bcl-2 apoptotic switch. FEBS Lett, 581, 5143-50.